Integrating computing and technology into the classroom and other subject areas is I believe essential. It is not good enough to have separate lessons just for coverage of a curriculum. Technology offers many opportunities to engage children with their learning. Throughout my teaching career I have made a point of integrating technology into the classroom and have observed its many positive outcomes, especially with children who are sometimes disaffected with education. On Saturday 20th May I am running a workshop on integrating computing and technology into the classroom. 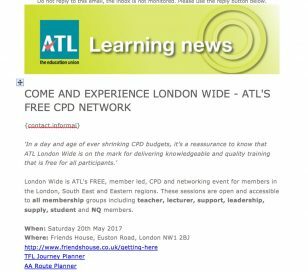 Many thanks to The Association of Teachers and Lecturers (ATL) who have invited me along to their one day CPD event in London. Technology and computing is here to stay for both adults and children. It is also worth mentioning that both groups are very likely to have a variety of different skill levels in this area. I think there is a great danger that with new young teachers, assumptions can be made that they may be more able at using technology than older teachers. I think this is a mistake, I have encountered many teachers and teaching staff of all ages who have different skills and attitudes to computing and technology. Podcasting in all subject areas. Audacity/recording during guided reading sessions. We will also be looking at some areas of the computing curriculum which may not be so clear on what to cover. There are of course other workshops on the day and I am looking forward to going to see some of them, it will be an excellent opportunity to do a spot of networking and improving my knowledge and skills in other education areas. You can download the invite below to view who the other attendees will be.